Your upholstered furniture needs cleaning from time to time to keep its beauty intact. The upholstered furniture is more likely to get dirty because of accidental spilling of drinks, wear and tear with time and other possibilities. The regular cleaning assures cleanup of unhealthy bacteria residing on your furniture due to your pet, environment and other possible reasons. It is always advisable to take the help of professional Upholstery Cleaning service provided by companies as they have required upholstery cleaner since they have appropriate upholstery cleaner according to the fabric of your furniture, well trained technicians and a proper understanding of required technology with years of experience. 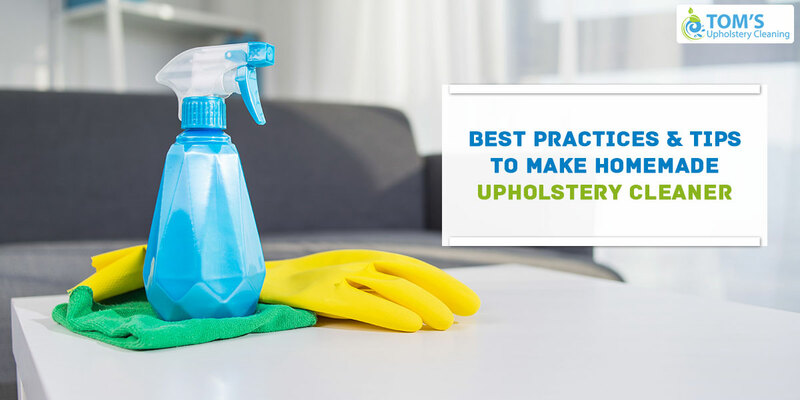 However, if there is no major cleaning job if there isn’t too much of a hassle and you want to remove a stain from your upholstered furniture, then you can make your homemade upholstery cleaner. Read on to find out how. read on to make your own upholstery cleaner at home. You can make a chemical free and environment friendly upholstery cleaner at home with simple ingredients. Once it is created, you can use it to remove stains from your upholstered furniture. Combine white vinegar, natural liquid soap and warm water in a spray bottle. Shake the bottle for five minutes to mix all ingredients well. That’s it! You’re Your natural and chemical free upholstery cleaner is ready to use. Use the spray bottle and homemade upholstery cleaner to mist the soiled area. Take a clean duster or cloth and rub the area in circular motion. Keep your hand gentle while rubbing; don’t scrub too hard, else it can hamper your furniture’s fabric. Take a clean cloth and moisten it with warm and clean water. Scrub the area with gentle hands. Repeat the process until you remove the excessive soap. Once the soap is removed, take a dry and clean cloth or paper-napkin to dry the area. The things to keep in mind is when you are rubbing the stained area, be very gentle. Also, don’t spill water or don’t use an overly too wet cloth while removing excessive soap else it would take a lot of time to take away the damp. If by mistake, you used very wet cloth while cleaning the upholstered furniture and blotting process with dry cloth didn’t work, you can use a blower at low speed. If you happen to use a very wet cloth on your upholstered furniture by mistake and the blotting process doesn’t work, then you can use a blower at low speed. The thing to keep in mind is to be gentle with your upholstered furniture to ensure you just take away the stain and not the beauty of the furniture itself. 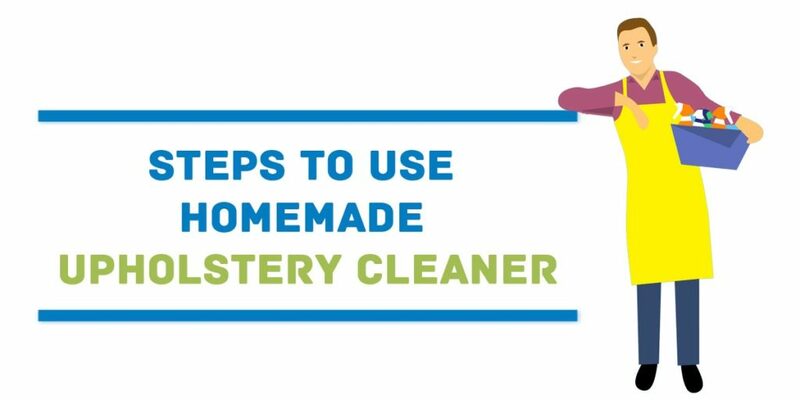 The homemade upholstery cleaner is more effective while applied on a fresh stain and also it will make the process easy and fast. The homemade upholstery cleaner is effective in most of the cases, but it doesn’t work with all types of stains. If it doesn’t work well, it is recommended to take the help of professional upholstery cleaning services.